Yesterday, my daughter and I were in search of a fun project, so we took a look through my copy of Martha Stewart’s Encyclopedia of Sewing and Fabric Crafts. 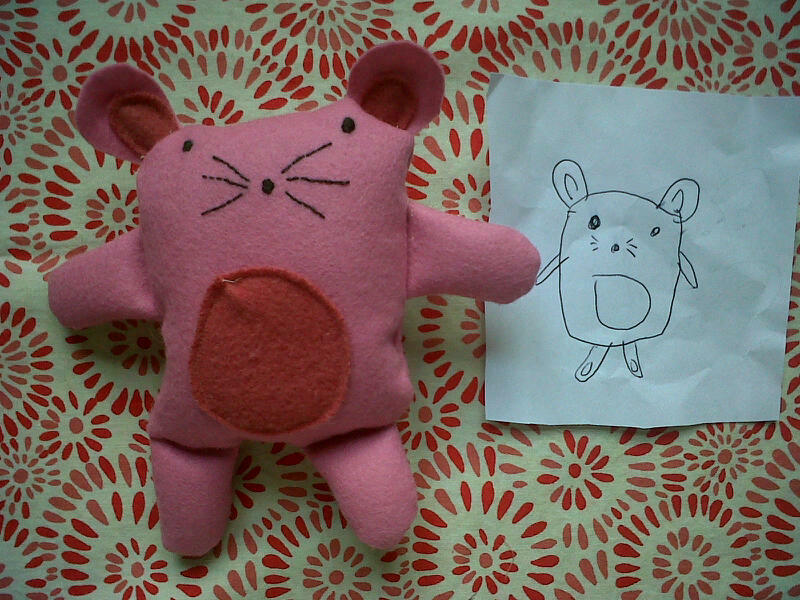 We found hand-drawn stuffed creatures and had to make one. We used wool felt in two colors, wool stuffing (which has a delicious sheepy smell) and some embroidery thread. First we cut out two pieces of felt in the shape of the body, made the ears (we added a small dart to give the ears a little shape), and made and stuffed the legs and arms. Next, my daughter drew the face right on the felt with a pencil and I embroidered the design. She cut out the tummy shape and I sewed it on using the machine. Then, we sewed the ears, arms and legs to the right side of the back facing in. Then, we sewed the front and back right sides together, leaving a hole for turning and stuffing. We flipped Squeaks right side out, filled her with stuffing, put in a little felt heart, and then sewed up the seam using an invisible stitch. We had a great time making Squeaks and were very pleased with the results! « Red and white quilt extravaganza! Those magazines were great. I have a few copies saved, too. I think many of the projects made it onto the Martha website. I can’t wait to see what you have been up to! I have some new placemats that are almost finished to show you, too.